The heading above is not a description of me , although some may argue that point ! I don’t know if it’s the weather or the time of year but I have become quite reflective of late and it was not so different last year either ! 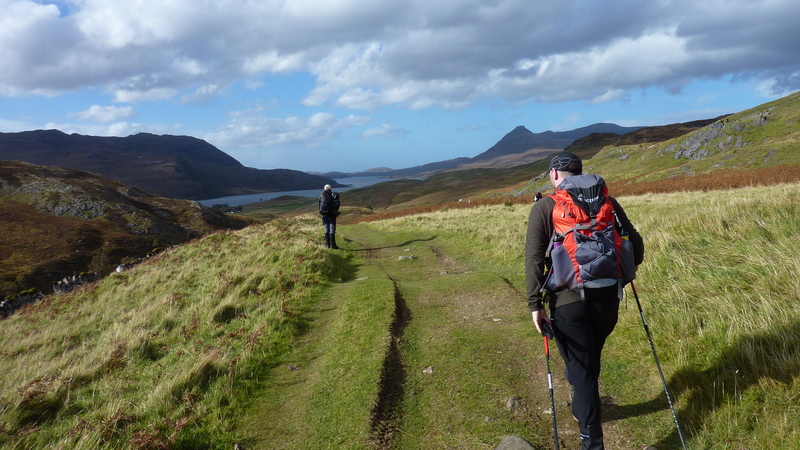 The other day when I put my pack on as we walked out the car park I had a memory from childhood revisited as I did up the hip belt. 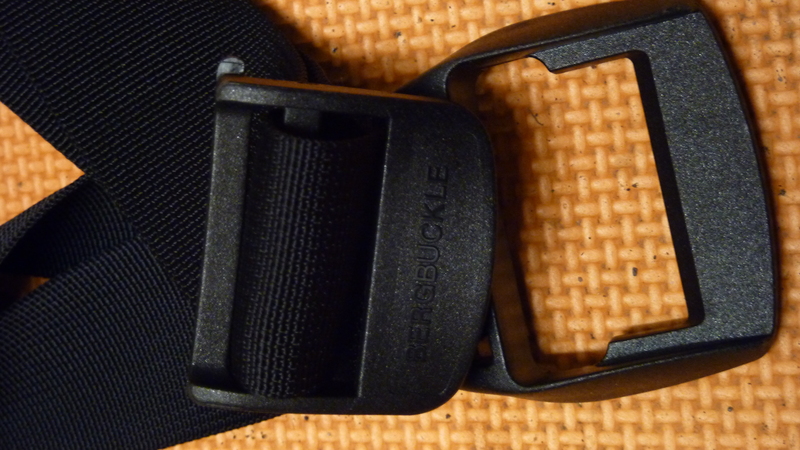 Yes the bergbuckle is still alive ! Now even to the kit nerds this probably means nothing but my first proper rucksack after an external frame affair was a Berghaus Cyclops Roc, my mate Dave Kerr was a Karrimor boy and when we were out camping we would constantly battle each other in a “Top Trumphs” kind of way about the merits of Berghaus V’s Karrimor. The Berghaus thing continued for years seeing me upgrade to a Crusader which was a whopping 100 Ltrs yes I filled it and carried it, god knows what it weighed ! I also had Yeti gaiters and a pair of Scarpa boots as they were in some way related to Berghaus. I guess its easy to become Loyal/Attached or blinkered by a brand and then fail to see whats out there for the better. I managed to get away from work whilst it was still light so boosted straight to Eaglesham moor to maximise what was left of the sunny day. So often I am up here training either on foot or the bike. This week I have been tired after work and have had Zero motivation to do anything, sunday showed that hill fitness departs rather quickly as I was “breathing through my hole !” most of the way up and come Mon/Tue I was feeling the work out. 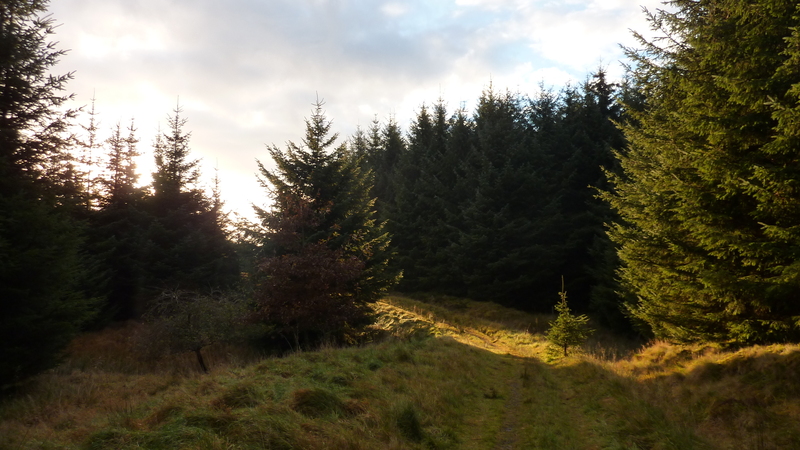 As I sauntered up the path I cut off at the new plantation of oak trees and walked slowly taking in the colours and sounds (or lack of them!). It’s normally dark at this point and I have some angry man shouting at me down my headphones from my I pod as I breathe hard and puff and pant my way through the trees. Not today ! I had a different tempo ! I looked around at the young Oak trees and sat as the sun moved across the horizon on its low orbit. I have attended a few conferences with work the past month and there have been some good guest speakers at them. Mark Beaumont was at the Mountain Bike Scotland conference in Perth, he talked well about his “journeys”. 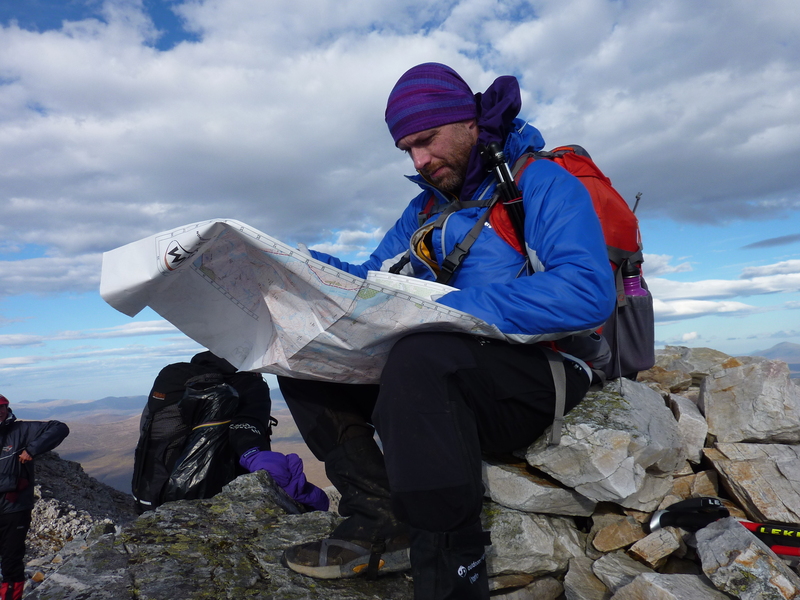 Stuart Boreham talked at the DofE Scotland conference in Aviemore. 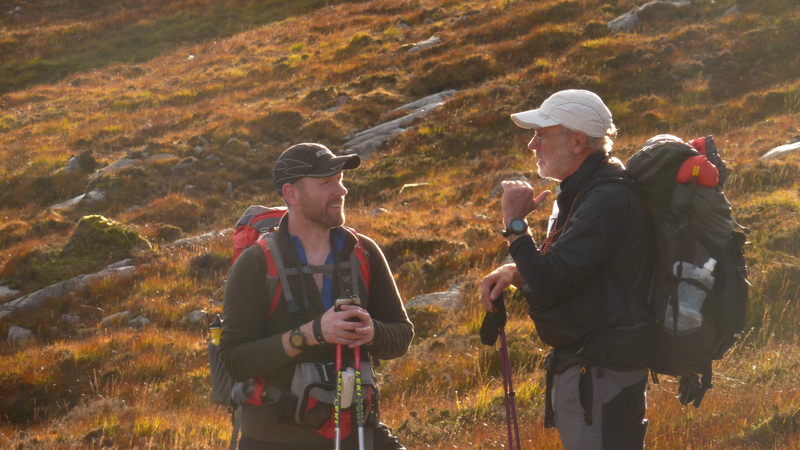 What struck me about these 2 guys was there approach to journeys and what it brings. As walked along I thought about my journey. There have been lots of little excursions but really what were they trials for ? Hands in pockets I walked on, the sun and the temp getting lower. 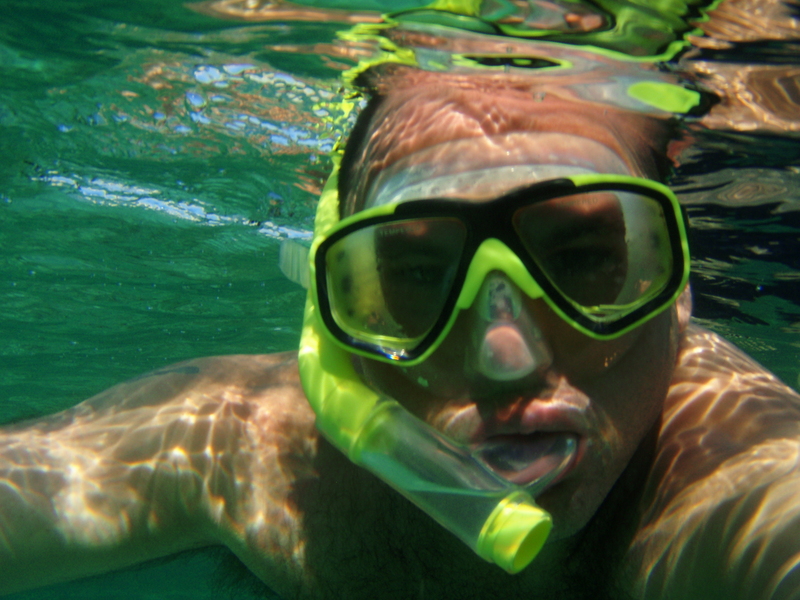 My old man thought for a while whilst I cringed and answered “an explorer”. My old man got me into the outdoors but not in a pushy way, he gave me opportunities to sample things and when I decided I was going to take things further doors opened for me to take that road. I at the time thought this was pure luck and now realise he had “picked” the locks to those doors so they would open a wee bit easier for me. A lesson for all parents there I think ! He always tells me as well to ” have a plan !” but at this moment in time my plan consists of keeping my head above water and out of debt ! Funny I have been in my job in Glasgow now coming up for 7 years (a lifetime record !). I make the most money I have ever made yet still at the end of month have nothing, hard to think many years ago I survived on probably a third of what I earn now. 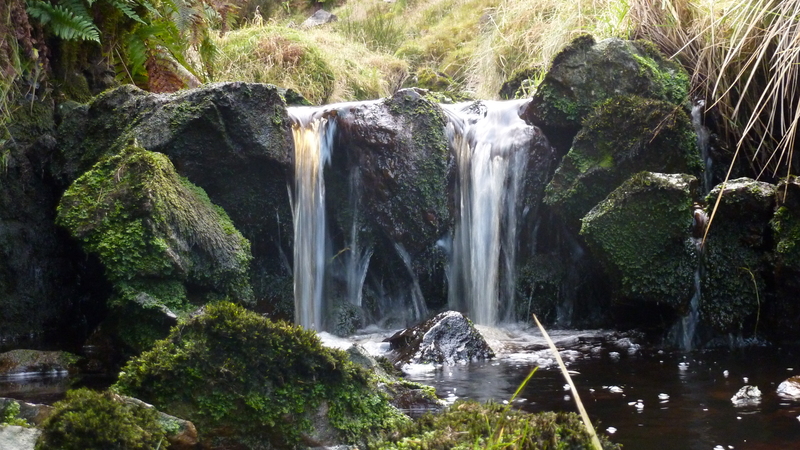 I dropped into the gorge side as I spotted a wee waterfall, I wanted to play with the camera and find that elusive shot I have been wanting for years that PTC and others do so well. After a bit of changing settings I climbed back out on my way to the track and started on my way back down the hill. The moon was out and the clouds were blowing past teasing us with the thought of a clear starry night. I wasnt ready to go back to the car so I sat on the wall and cut away at a stick, letting the world go on its way. Reluctantly (I had no stick left) I walked down the hill to the car, hands in pockets, no chest strap fastened, no hip belt on ! So the journey goes on, what the final goal is who knows ! 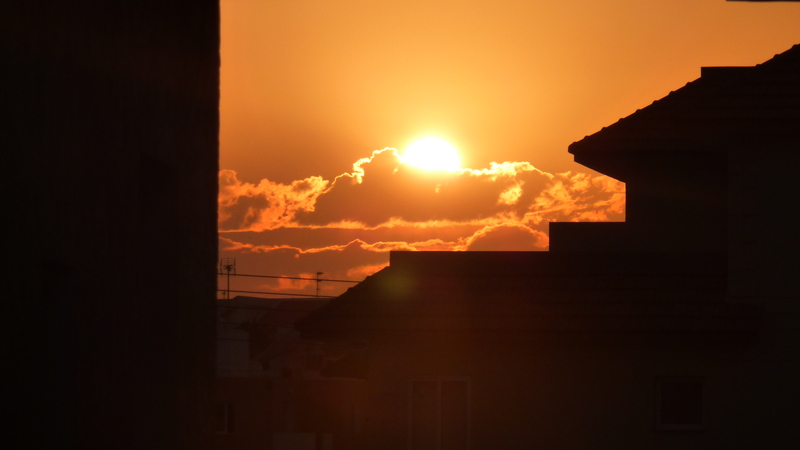 One thing for certain is the sun goes down at the end of the day ! 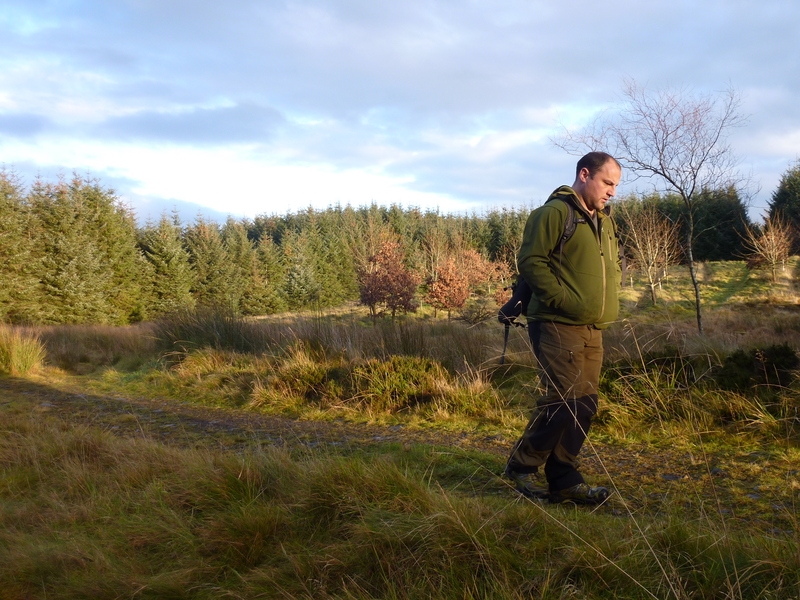 It had been a while since I had been out in the hills properly ! 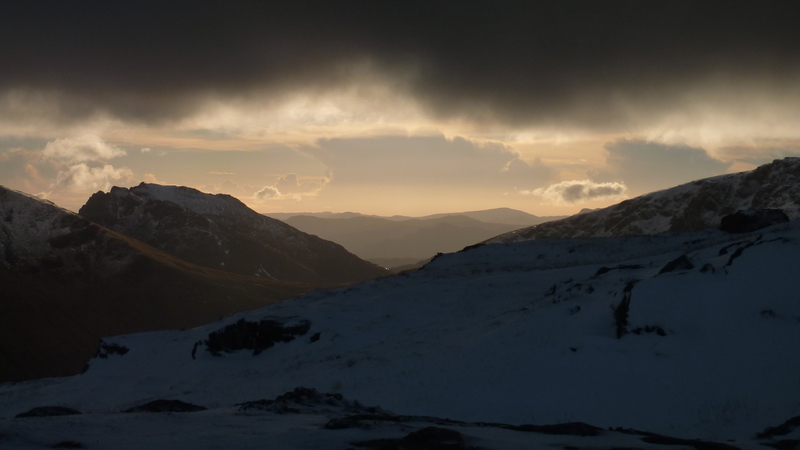 The weather had been changeable and there was snow on the hills. 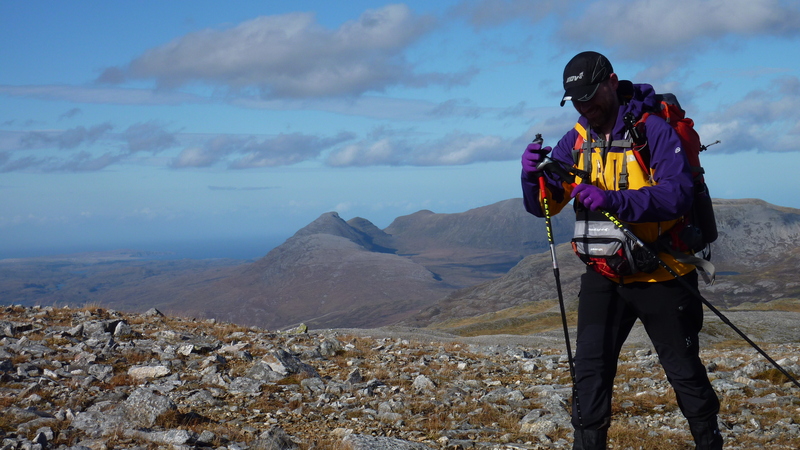 After my event got cancelled I met PTC and Stu at Tiso cafe we had lunch and thrashed out an up and coming mission. I quizzed PTC as to his movements at the weekend and did he fancy doing something ? Both of us ended up with stuff to do Sat and apart from that the weather wasnt great either. After a phone conversation it was decided we were heading out, destination unknown we would decide on route as we do so often. I picked PTC up and we headed North on the A82. 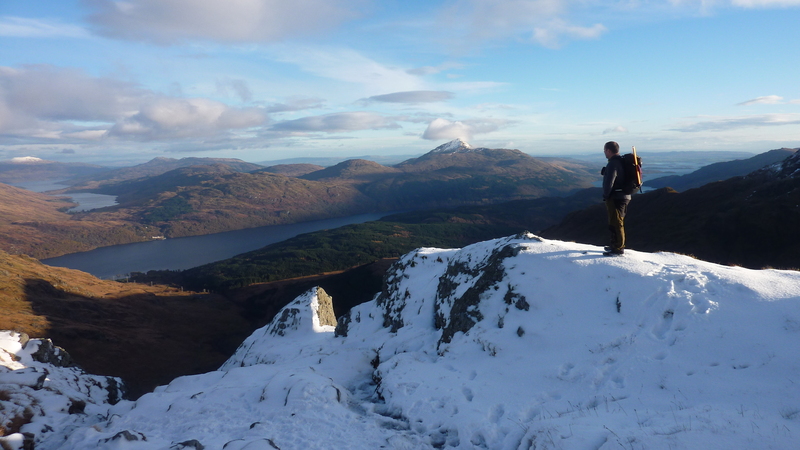 There wasnt as much snow on the tops as I thought there would be, we ignored Arrochar and turned off still on the A82. Glimpses of stuff through trees wet our appetite, I and even “we” had no agenda, no deadlines no crucial shots to get, instead we were out to satisfy the need to be playing outdoors in the sunshine and the cold ! 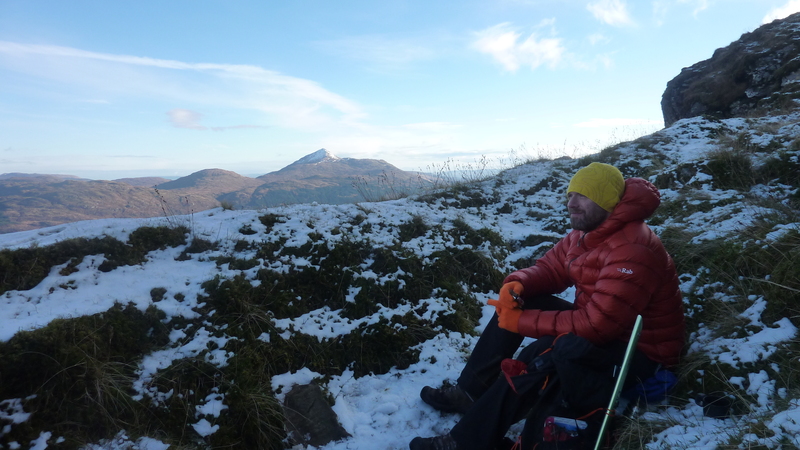 We pulled into the car park at Inveruglas, I packed my kit into the Berghaus Sentinel as PTC grabbed some food and a cup of coffee from the visitors centre. 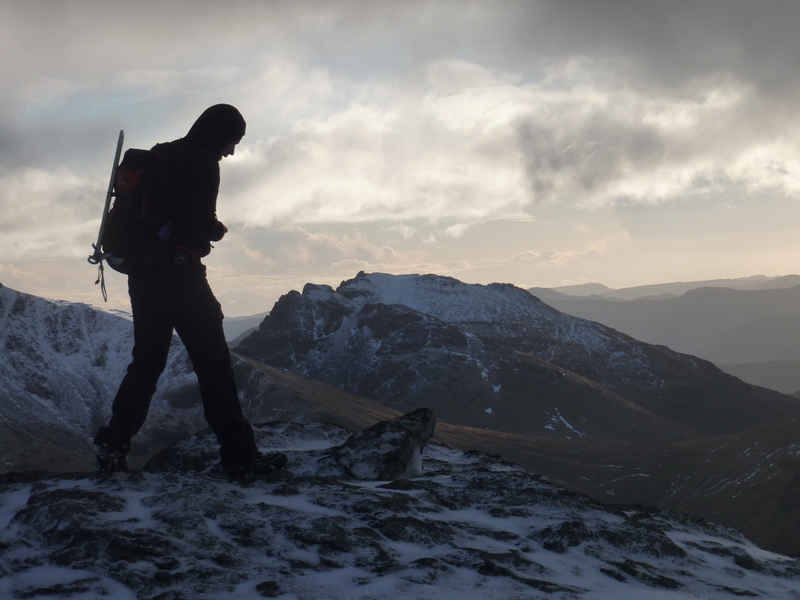 It’s always a lottery when the weather is that in between phase, is it winter or autumn, crampons or not, ice axe or not, snowclaw/shovel or not. 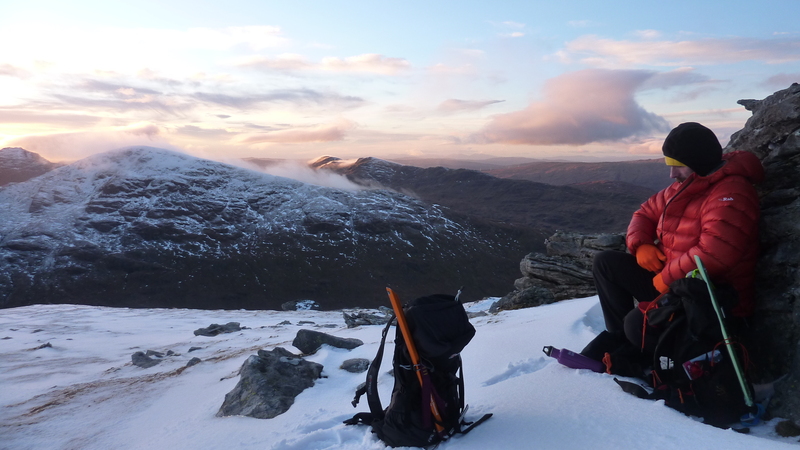 I opted for the microspikes and stuck the snowclaw in and strapped the ice axe onto the pack. For all the weight it was, I would rather have it and not use it than regret having left it in the car as I have done in the past. We were soon breathing hard as we stepped up the path by the Hydro station and wasnt long till the sun warmed us as well as the heat from our effort. Once off the track we were in the shade and it soon cooled down, the frost was still sitting on the grass and the ground was wet but with a distinct frozen base to it. 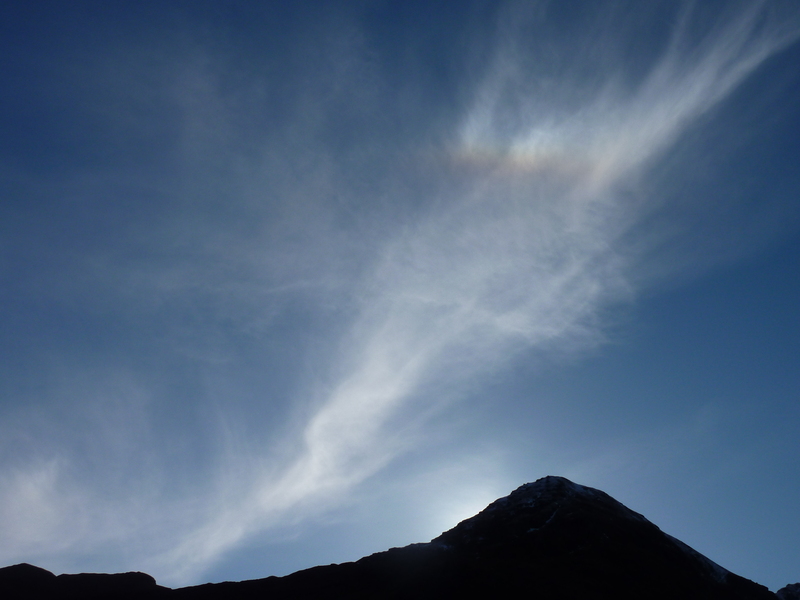 The sun lit the autumn colours up on the hill side and patches of thin cloud and missed passed and created rainbow type colours in the vapour. 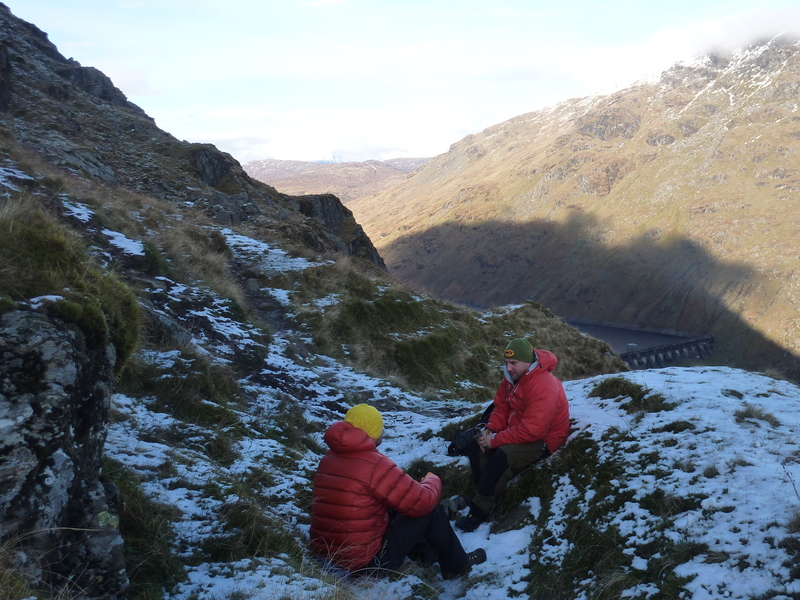 We passed a few people coming down and a few people passed us as we stopped for a bite to eat and a brew in a wee dookit out the wind and just below the snow. 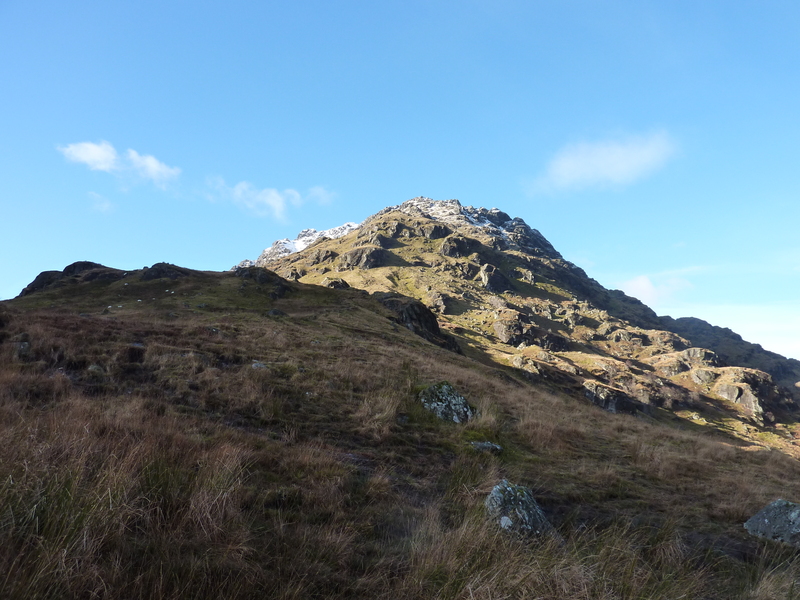 I think we constantly drive past hills like this in a rush to get to the “proper mountains” but Ben Vane really does give you a steep challenge with exposed little outcrops so you have to earn the summit. 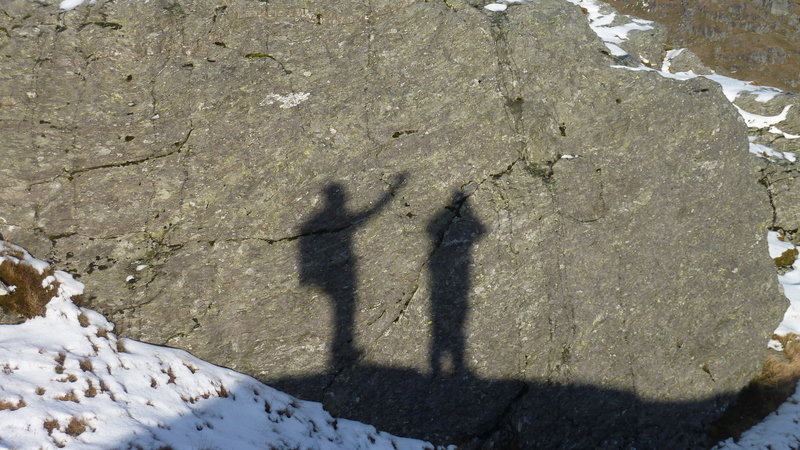 As the sun sank in the sky our shadows were cast on the outcrops almost like strange cave paintings. Not much further on and not far from the top the cloud starting rolling and creating a much “moodier” feel to the hills all around. 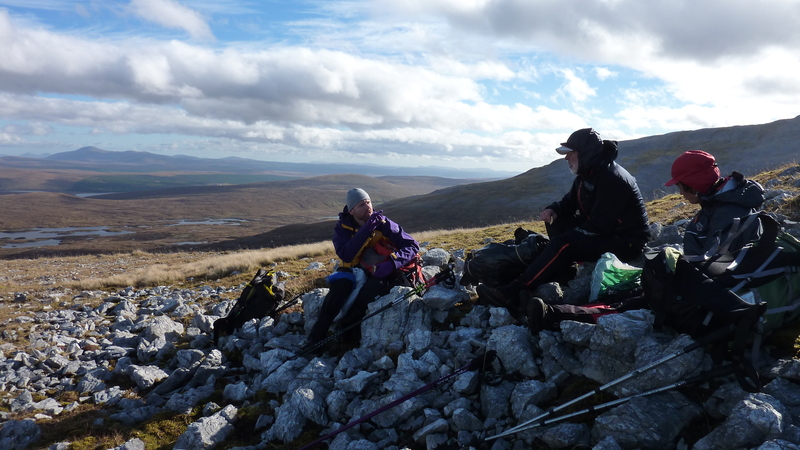 We had another brew on the summit, and stuck our insulating layers, hats and gloves on. PTC had his Hillsound Trail Crampons on as the snow and ice was brick hard, I had Icebugs on so did not have to bother with the Microspikes. 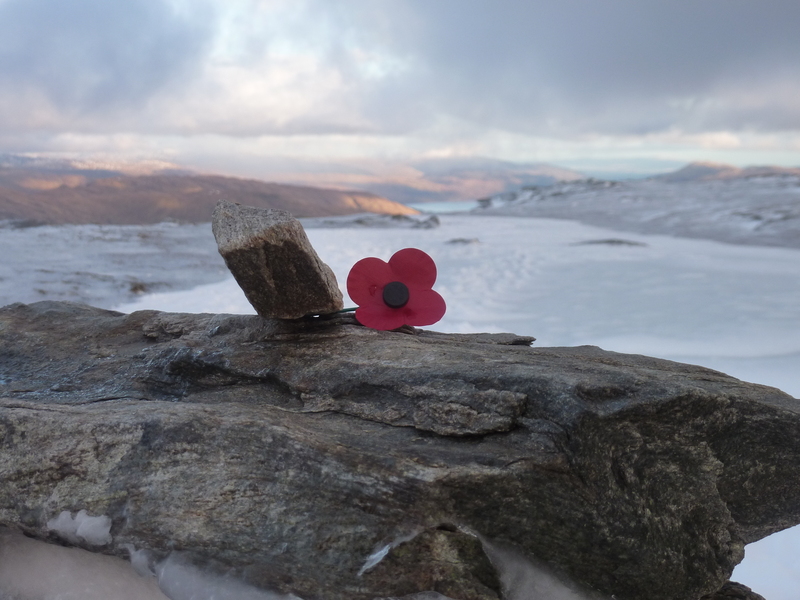 Some kind soul had left a poppy on the cairn which added to the atmosphere on the top. 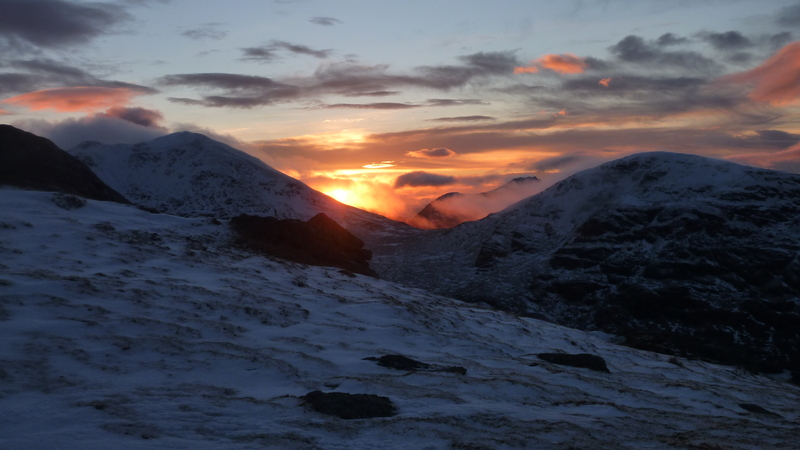 We were both dragging our heels to leave the summit, we should of been pitching tents and climbing into cosy down bags and listening to the roar of the gas stove in anticipation of dinner and a hot cuppa soup. 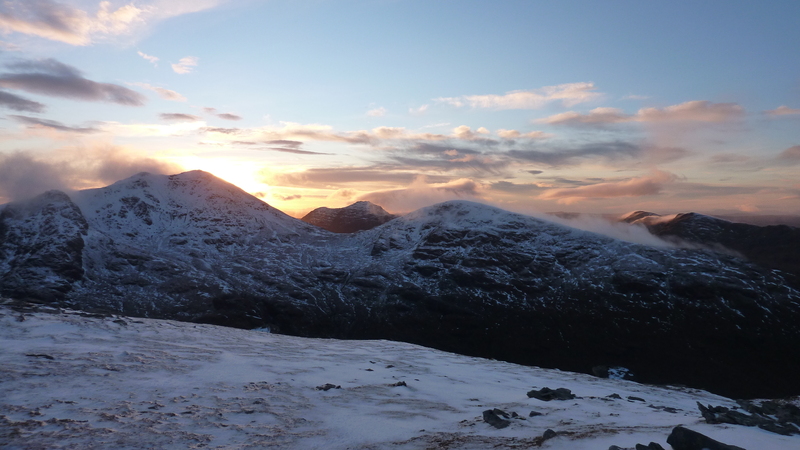 Instead we sat and watched the sun disappear behind Ben Ime and Narnain and the cloud roll over the ridges like an eerie fog ! It was time to move not because it was getting dark but more we were hungry and it was getting really cold, so much so I kept the Berghaus synthetic Duvet on as we dropped carefully to the Lochan and then down through the boulder field of caves and bottomless holes (it was dark and you could not see the bottom ) ! We played about with cameras trying to get that great blurry effect of water moving, PTC I am glad to say managed, I did not. Layers off we hit the track and passed through the tunnel and followed the track back to the road. It was a half-moon and the stars were bright, funnily enough we both switched our torches off/ or did not switch them back on after pictures ! My Icebugs crunched loudly on the tarmac all the way back to the car. Winter is here for sure and you know what that means ! Aye smug grins all round ! I have had a wee break since the Coast 2 Coast apart from the odd bike ride and jaunt into the hills. I also have had the cold since the C2C and for some reason can’t get rid of it ! So last night I shook the lethargy and hit my usual training area for a short circuit. 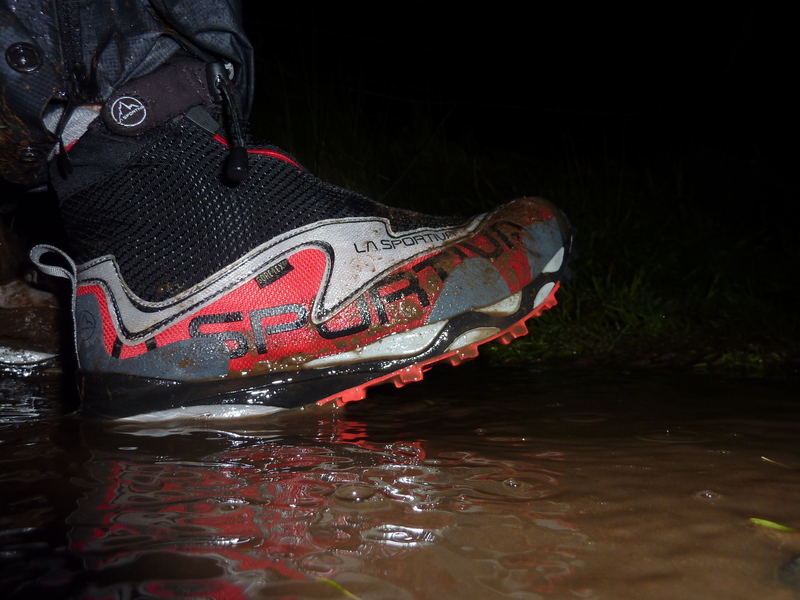 Due to all the rain it was boggy beyond belief ! 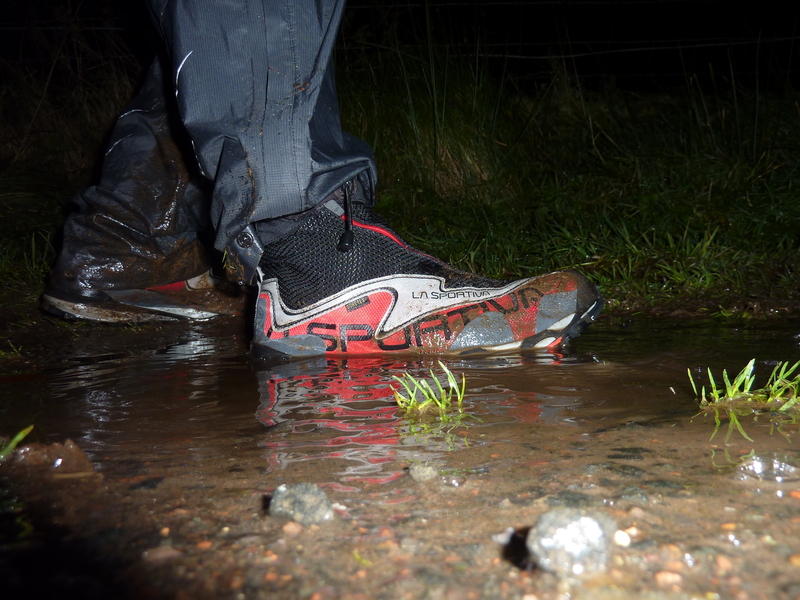 I did not mind as I had a pair of La Sportiva Crossovers on. PTC has a more technical write-up here, the only reason I have them is because in these shoes you must get a size bigger than your standard La Sportiva size ! Initial thoughts are good, wet rock and wood should be avoided in these as they are a bit slippy but I put that down to them being out the box ! As per usual I will put them through hell which may include the Deerstalker run in March ! Off to check the weather forecast for the weekend as its been way too long since I have been out to play ! 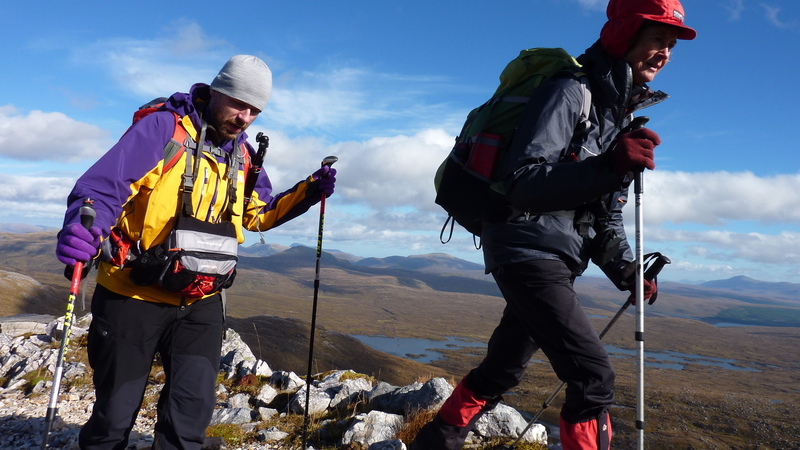 A gradual climb brings you onto the bleak flat of Beinn an Fhurain. This is also the site of a crashed RAF Avro Anson, unfortunately the crew of six all died either due to the crash or to the bad weather that caused them to ice up and crash. 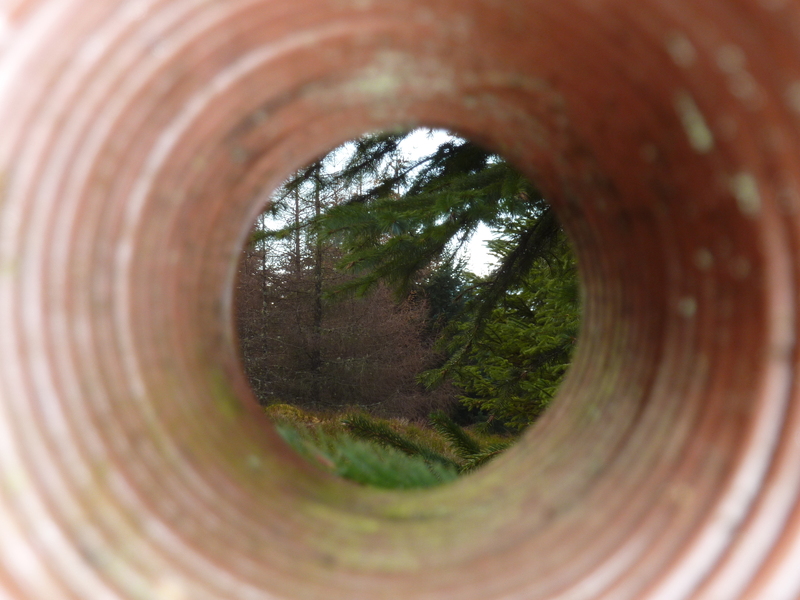 The isolation adds a certain atmosphere to the cairn that the Aberdeen Air Cadets rebuilt in 1985. 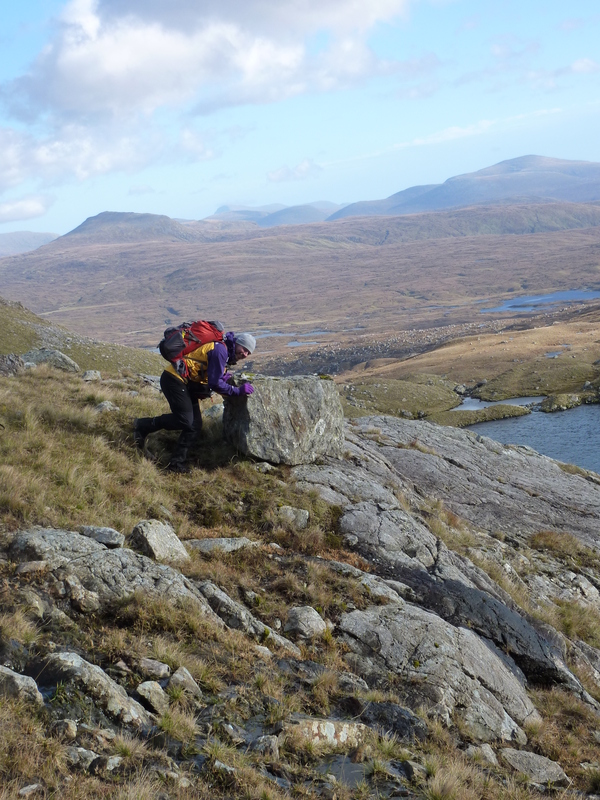 Onwards we plodded towards the ridge as we all swapped discussions on geology, kit history, mapping and even religion. It’s great to be out with people from different backgrounds, I suppose it’s a bit like travelling around the world and taking bits of cultures you like and saying no thanks to the bits that you don’t. 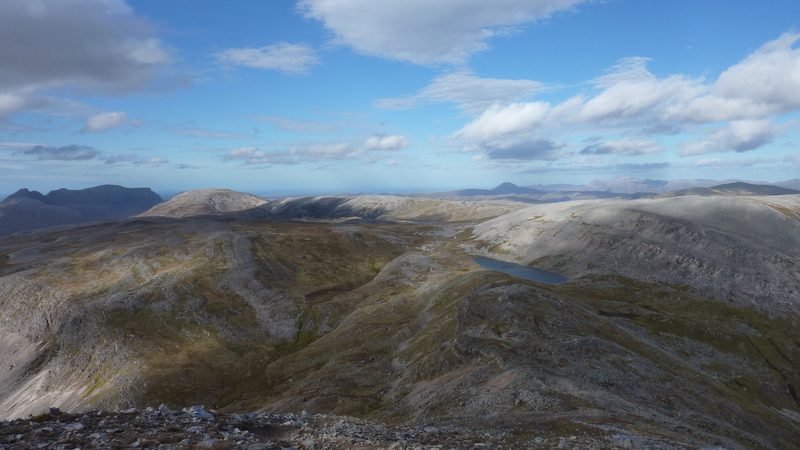 It would have been easy just to cut straight across the flat moorland heading for Lochan at the bottom of Connival, but the team without a word of discussion were drawn towards the magnificent craggy ridge line. We stopped just as the ridge started forming that leads up to the 860m top of Na Tuadhan, this hill is not named on the Landranger1:50,000 interestingly enough. A quick snack and then we were off again. The terrain here changes from heather and grass to bare grey rock. The ridge we followed was like an amazing geologic (is that a word ?) wave that had frozen in time. 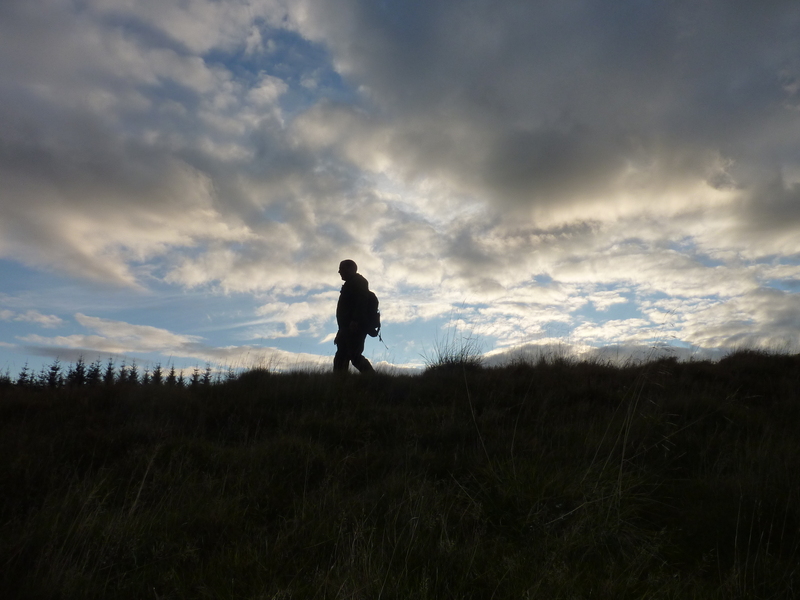 The sky remained clear but on the ridge the cold wind stung any exposed skin as we pushed on. On the top we were greeted with amazing views whichever way we looked. 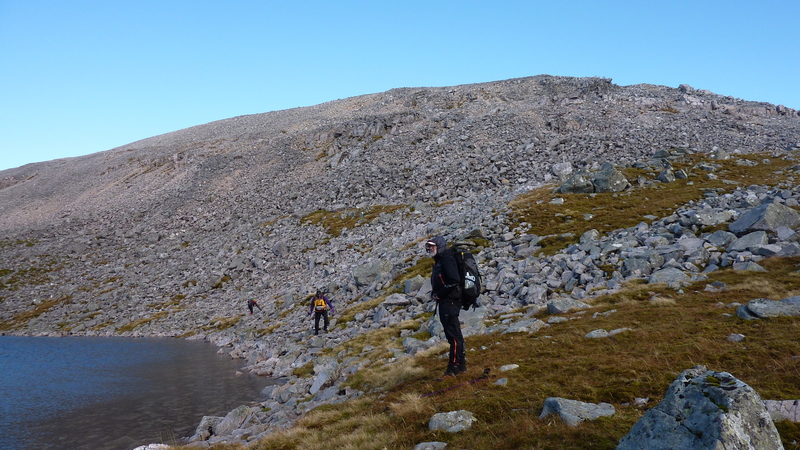 Dropping down to the lochan was an interesting route, there is no path which is refreshing, just a slope of loose moving pebbles rocks and boulders. We all picked our own lines down and after filling bottles up in the crystal clear waters we began the climb to the top of Conival. 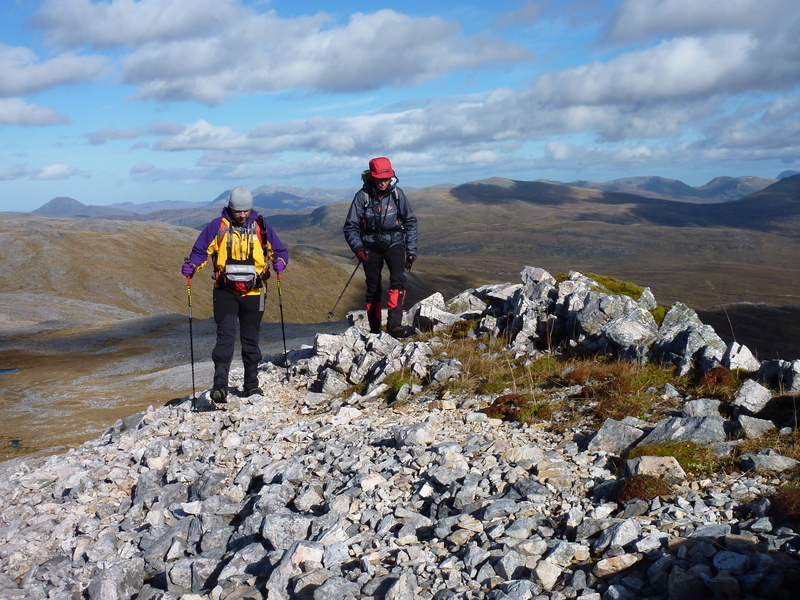 On the ridge you pick up a faint path that winds through the lumps of rocks and scree slopes. As always its always worth while to look behind you to remind you where you have been already. Again we stopped for a quick munch, PTC delving into a Pot Noodle and I had some curry soup. Neither of which particularly high in calories but some warmth and taste was very welcome. Sitting drinking my soup I could not stop smiling as I drank in the amazing views all around me. On the move again the gap that looked short on the map to the top of Ben More Assynt took a bit longer than I thought it would. Again the terrain offering amazing contrasts to keep you focused and distracted at the same time. On the top we discussed options for camping whilst looking at the map, the great thing about carrying overnight kit is that there is no rush. 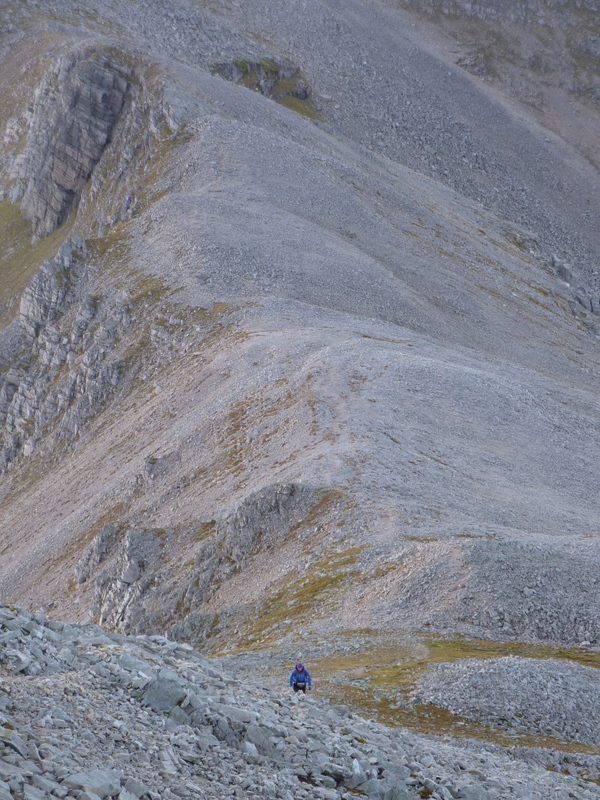 We headed almost due North off the top almost taking a straight line to Coire a Mhadaidh. 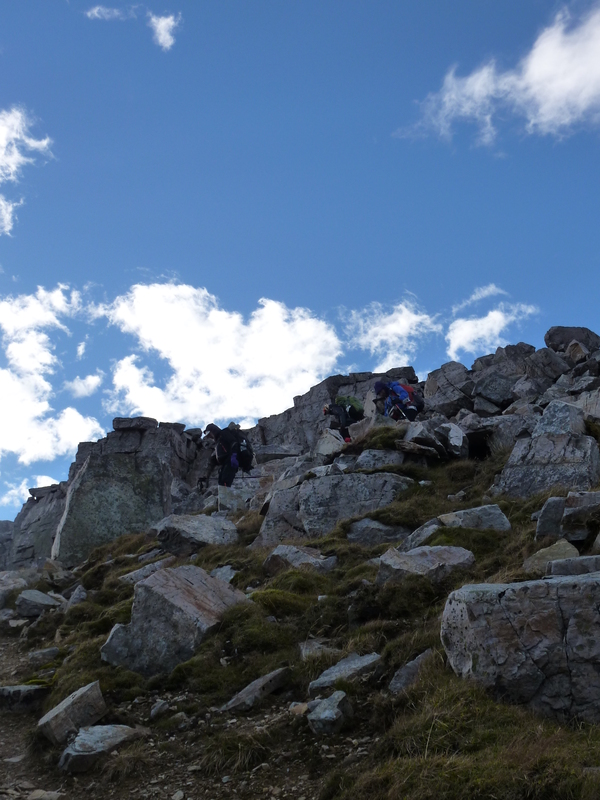 This was not without challenge as the slopes were full of little crags and loose scree slopes. We all picked our own ways down again, my knee was starting to ache a bit due to the effort of resisting against the steepness of the slope. 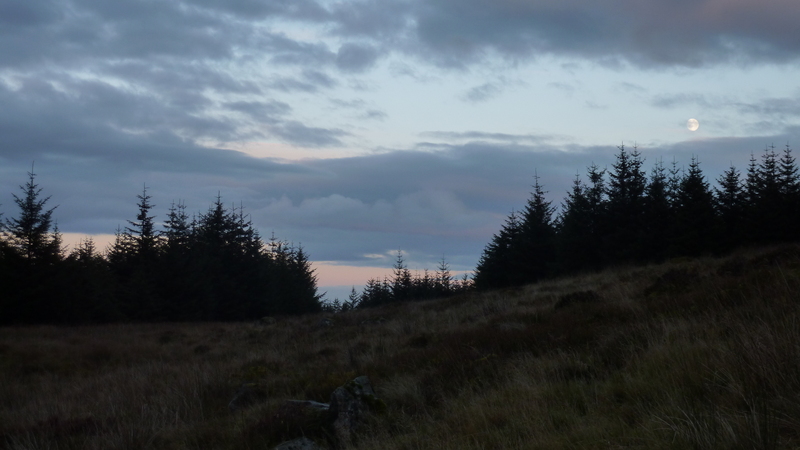 Red dear roared and we caught the occasional glimpse of a stag or the heard moving as we disturbed them from their sheltered bit of hill. 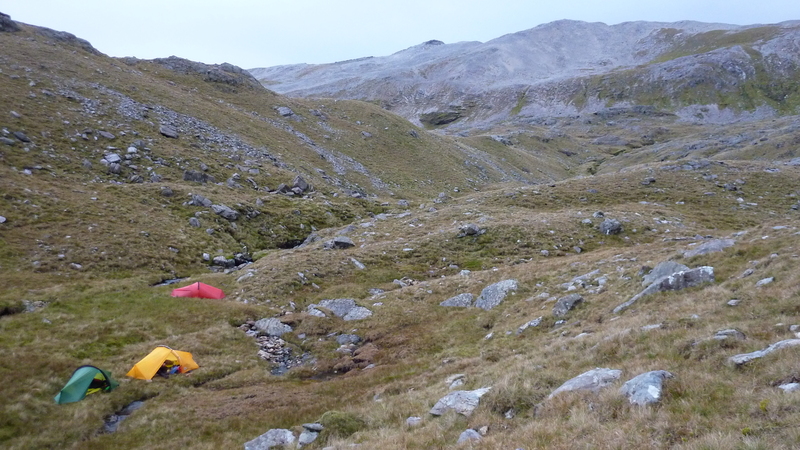 We spent a bit of time scanning for a campsite once by the lochan. The original flat spot we thought might be ideal was getting hammered by the wind bouncing off the crags. 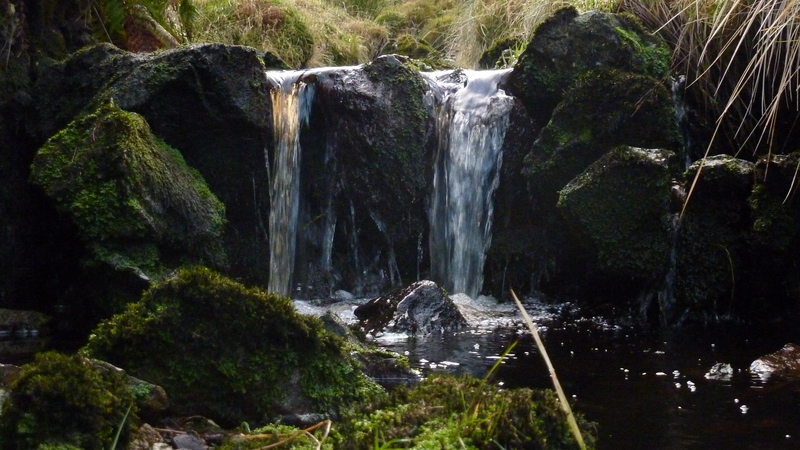 We opted for a dip just around the lochan that offered a bit of shelter but not much ! Flat dry ground was at a premium so PTC’s tent ended up close to mine, which was alarmingly un text-book close to a small stream. It was nice to get in the tent and out of the wind for a change, I sparked up the stove for a brew and then boiled more water for dinner. 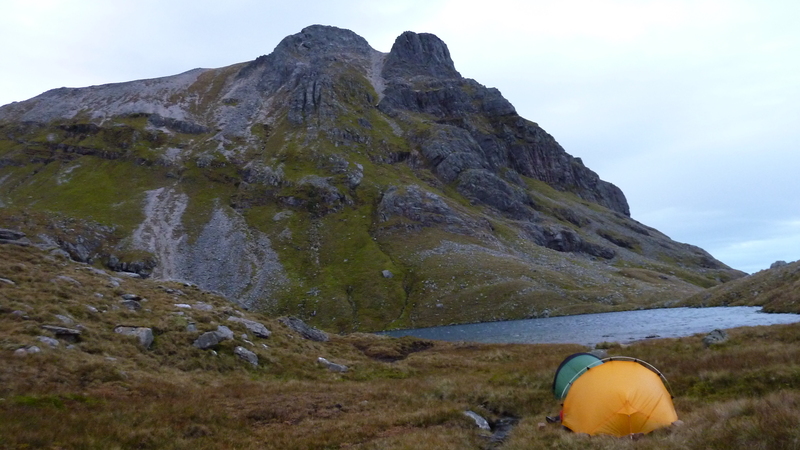 I lay in the tent all smug and warm reading my book as the wind grabbed and pushed at the wee tent. I was convinced that the only reason that it was still there was because I was in it ! I drifted off to sleep after dinner but was woken by the roar of the wind on the crags and the battering of the rain on the fly sheet ! 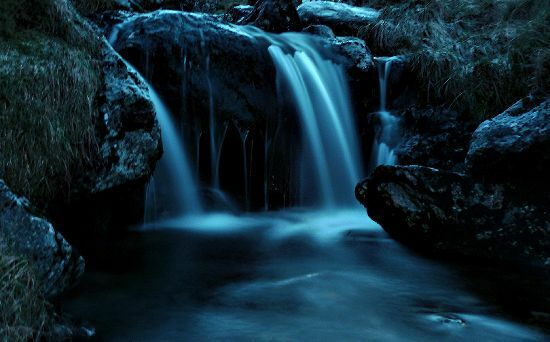 Given it was raining heavy and my proximity to the stream I sorted my kit for a quick “bug out ” the stuck my I pod on and drifted in and out of sleep for the rest of the night. Again it had cleared and although windy still the rain clouds had lifted meaning we could pack the tents away dry and get on our way. A short climb later we were almost back on the saddle next to the wee lochan we had passed the day before. Customary it is on every trip I have with PTC we need a silly picture of PTC so here we are ! 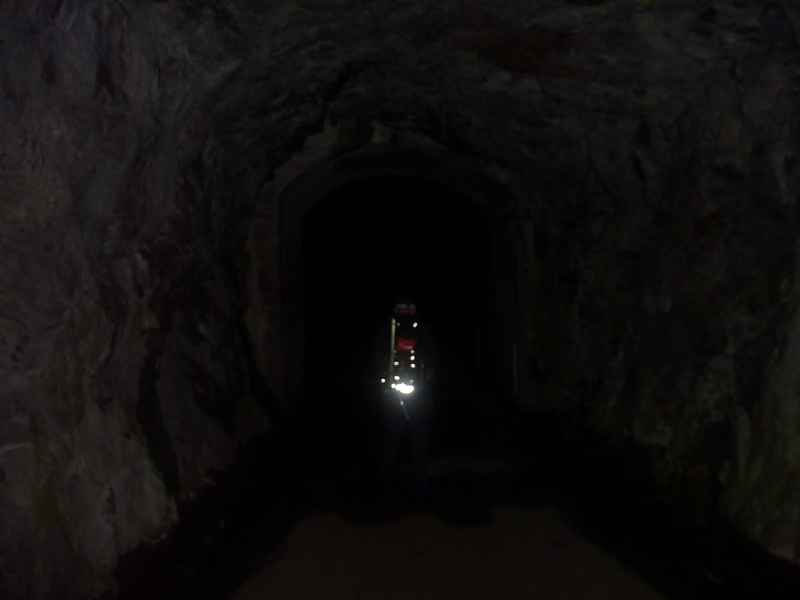 At some point I skirted round the big block of rock and got separated from the rest of the team. 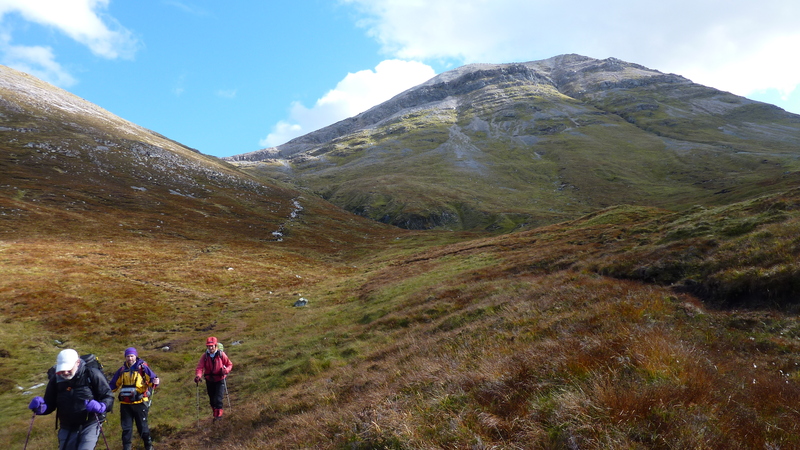 I had not looked at the map either and as far as I was concerned I was heading back across Beinn an Fhurain, I stood waiting for the team and then finally saw them way lower than me on the slopes of Gleann Dubh. 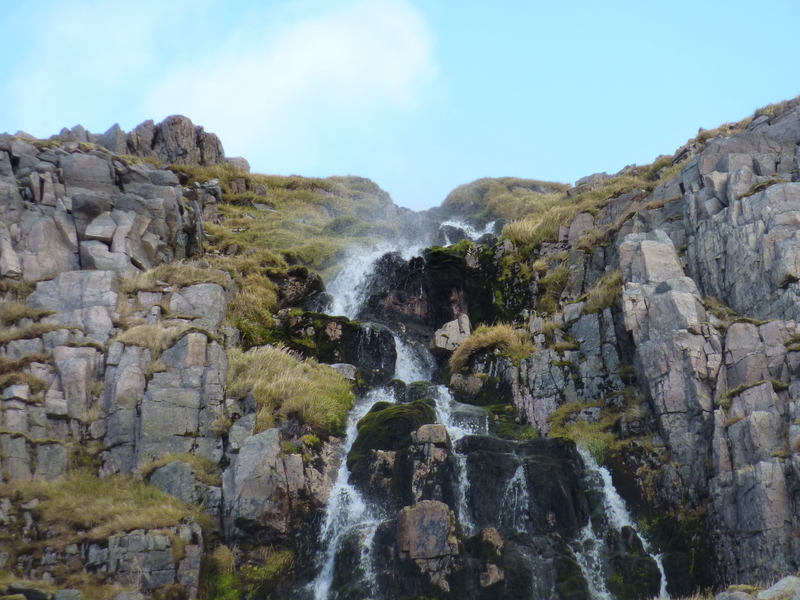 Despite the path winding its way through the rocks it has an interesting few wee scrambles this and the fact the wind was blowing the water back up the waterfall made it a nice way off the hill. As we dropped into the shelter of Gleann Dubh the terrain changed back to the grassy heather but the path was still surprisingly dry under foot apart from one bit that PTC found which turned out to be slippy under foot. This left PTC on his arse wich although could have been funny in some eyes gave some concern as he did fall hard. With only his modesty fractured we pushed on to the caves. 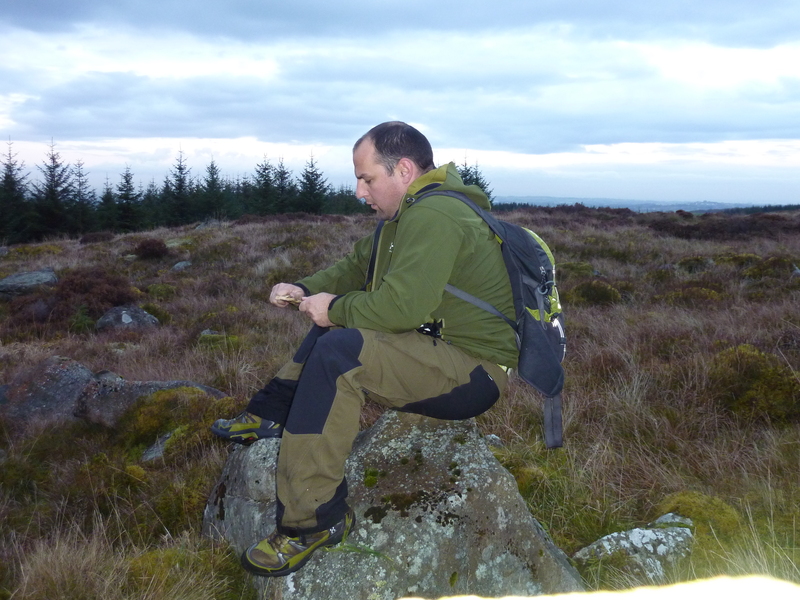 PTC decided to explore the weird Geological features up close and followed the river on its journey underground, mike and I decided to sit on the grass and have a chat, it wasnt long till Marian came out with a failing head torch the PTC returned. We were in no rush as we sat at the mouth of the cave on the short grass out the wind and chatted. It almost felt like none of us really wanted to walk that last couple of KM’s back to the cars. Eventually after much debate but no success in sorting the problems of the world out we walked up onto the track and plodded back to car for a celebration of mini irn-Bru’s all round. A quality trip with great and interesting company, there is still plenty to be done in this area that’s for sure ! And by the way ! That last post was number 100 ! 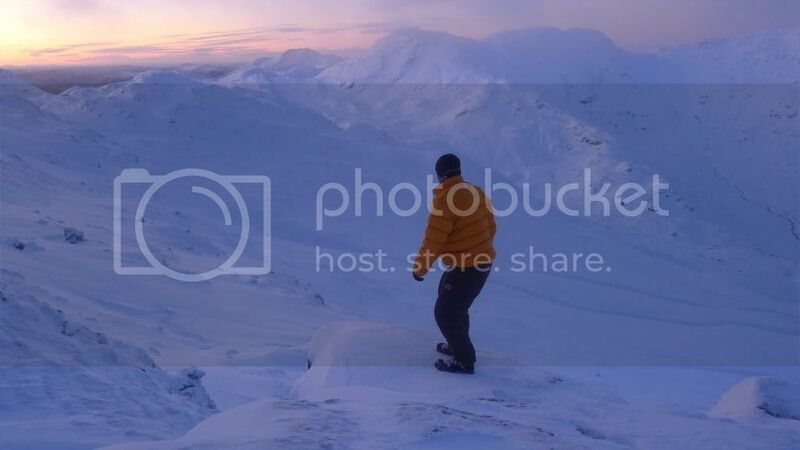 The blog is now 2 years old so I have averaged 50 posts a year.